Date: May 4 2019, 7 a.m. - May 5 2019, 7 p.m.
Mount Hood, located about 50 miles east of Portland, Oregon, is one of the most climbed glaciated peaks in North America (#2 in the world behind Japan's Fuji-san, according to some). While it last erupted in 1907 and still has active fumaroles, it is now considered a dormant volcano. Its relatively low altitude (compared to Rainier and Shasta), easy approach, and short hiking/climbing distance (see South Side Route below) makes it much more popular among less experienced climbers. These climbers, lacking experience, and severe weather, which can move in quickly, account for most accidents. Skiers can descend directly from the summit. Dogs are permitted and frequently make the summit. Included: Tent, Sleeping Pad, Mountaineering Boots, Crampons, Ice Axe, Harness, Helmet, Technical Hardware, Ropes. Stoves and Fuel. NOT Included: Sleeping Bag (30 Degree or lower), Backpack (65-75 Liters), Clothing appropriate for conditions (NO Cotton! ), Cord and Webbing appropriate to climb, and food for the duration. We can assist you in selecting appropriate clothing. Must be at least 18 years old to participate. All minors under 18 must be accompanied by an adult with prior approval from lead climbing guide. Prerequisites: Must be a graduate of Basic Climbing Course or have substantiated climbing experience. 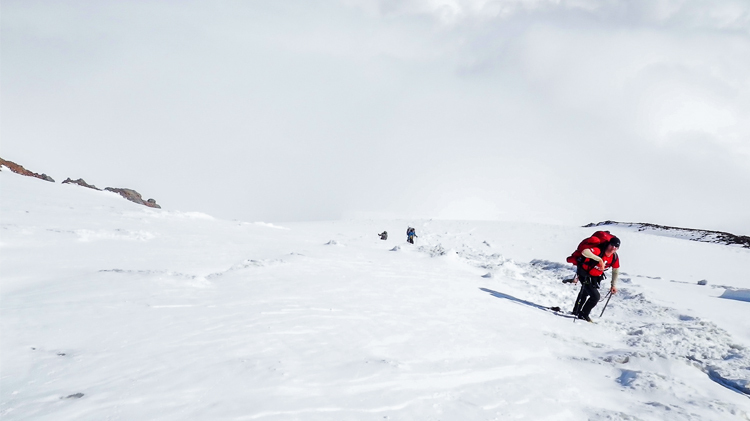 *Climbs are subject to cancelation base on weather, route, avalanche danger or lack of appropriate amount of climbers.